Jarasandha (Sanskrit: जरासंध) was A badass villain from Hindu Mythology. He was the king of Magadha. 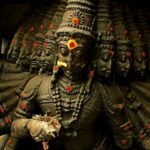 He was the son of a Vedic king named Brihadratha. He was also a great devotee of Lord Shiva. But he is generally held in negative light owing to his enmity with the Yadava clan in the Mahabaratha. Brihadratha was the king of Magadha. His wives were the twin princesses of Benares. While he led a content life and was a famed king, he was unable to have children for a very long time. Frustrated over his inability to have children, he retreated to the forest and eventually ended up serving a sage named Chandakaushika. The sage took pity on him and on finding the actual cause for his sorrow, gave him a fruit and told him to give it to his wife who in turn will soon become pregnant. But the sage did not know that he had two wives. Not wishing to displease either wife, Brihadratha cut the fruit in half and gave it to both of them. Soon both the wives became pregnant and gave birth to two halves of a human body. These two lifeless halves were very horrifying to view. So, Brihadratha ordered these to be thrown in the forest. A demoness (Rakshasi) named “Jara” (orBarmata) found these two pieces and held each of these in her two palms. Incidentally when she brought both of her palms together,the two pieces joined together giving rise to a living child. The Child cried loudly which created panic for Jara. Not having the heart to eat a living child, the demoness gave it to the king and explained him all that happened. The father named the boy as Jarasandha (literally meaning “joined by Jara”). Chandakaushika arrived at the court and saw the child. He prophesied to Brihadratha that his son will be specially gifted and would be a great devotee of Lord Shiva. In India, descendants of Jarasandh still exist and use Joriya (which means piece of flesh named after their ancestor, “jarasandha”) as their suffix while naming themselves. Jarasandha became a famed and powerful king, extending his empire far and wide. He prevailed over many kings, and was crowned emperor of Magadha. Even while Jarasandha’s power continued to grow, he had concerns over his future & that of the empires, as he had no heirs. 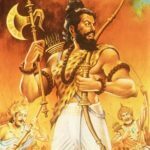 Therefore, on the advice of his close friend kingBanasura, Jarasandh decided to get his two daughters ‘Asti and Prapti’ married to the heir apparent of Mathura, Kansa. Jarasandha had also lent his army and his personal advise to Kansa to create a coup d’état in Mathura. Yudhisthira was planning to make a Rajasuya yagna or Ashwamedha Yagna in order to become the emperor. Krishnaconvinced him that Jarasandha was the only obstacle to oppose Yudhisthira from becoming an emperor. Jarasandha raidedMathura (Krishna’s ancestral capital) and got defeated by Krishna every time. At one stage to avoid unnecessary loss of lives, Krishna moved his capital to Dwaraka, in one stroke. Since Dwaraka was an island city guarded heavily by Yadava Army, Jarasandha was not able to invadeDwaraka anymore. To attain the capacity to invade Dwaraka, Jarasandha planned to conduct a Yagna to please Lord Shiva. For this Yagna, He had imprisoned 95 kings and was in need of 5 more kings, after which he was planning to perform the Yagna, sacrificing all the 100 kings. Jarasandha thought that this Yagna will make him win the powerful Yadava Army. The kings captured by Jarasandha wrote a secret missive to Krishna to rescue them from Jarasandha. Krishna, not wanting to go for an all out war with Jarasandha to rescue the captured kings, in order to avoid a major loss of lives, devised a plan to eliminate Jarasandha. Krishna advised Yudhisthira that Jarasandha was a major obstacle and must be killed before Yudhisthira starts performing the Rajasuya yagna. 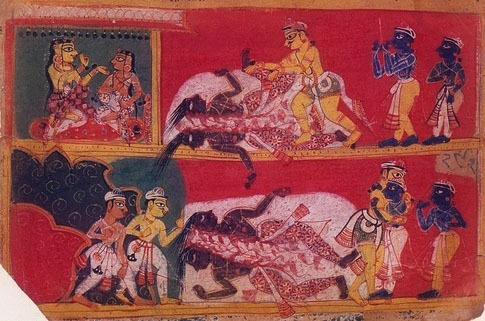 Krishna planned a clever scheme to eliminate Jarasandha by making Bheemawrestle with the Jarasandha in a dual fight, who killed Jarasandha after a fierce battle (Dwandwa yudha), which lasted for 27 days. Like Karna, Jarasandha was also very good in giving charity donations. After performing his Shiva pooja, he used to give whatever the Brahmins asked for. On one such occasion Krishna, Arjuna and Bheema in the guise of Brahmins met Jarasandha. Krishna asked Jarasandha to choose any one of them for a wrestling match. Jarasandha chose Bheema, the strongman, to wrestle. Both of them fought for 27 days. Bheema did not know how to defeat Jarasandha. So, he sought the help of Krishna. Krishna knew the secret by which Jarasandha could be killed. Since, Jarasandha was brought to life when the two lifeless halves joined together, conversely, he can be killed only when these his body was torn into two halves and find a way as how these two don’t merge. Krishna took a stick, he broke it into two and threw them in both directions. Bheema got the hint. He tore Jarasandha’s body into two and threw the pieces in two directions. But, these two pieces came together and Jarasandha was able to attack Bheema again. Bheema got tired after several such futile attempts. He again sought the help of Krishna. This time, Lord Krishna took a stick, broke it into two and threw the left piece on right side and the right piece on the left side. Bheema precisely followed the same. Now, he tore Jarasandha’s body into two and threw them in opposite directions. Thus, Jarasandha was killed as the two pieces could not merge into one.